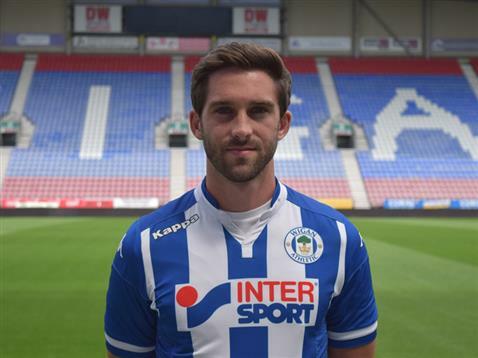 Will Grigg opened the scoring for Latics. Photo courtesy of Wigan Athletic. Wigan gave Scunthorpe a footballing lesson as they recorded their first win of the 2015/16 League One campaign. The 3-0 scoreline did not flatter Latics as they dominated proceedings throughout the 90 minutes. Will Grigg gave Latics the lead from the penalty spot after only three minutes and Donervan Daniels doubled the lead on 27 minutes before Craig Davies completed the rout on 70 minutes. In truth it could have been many more as Scunthorpe offered only limited resistance to a free-flowing home team. Latics newly assembled team were nearly always quicker to the ball and slicker in their passing than their opponents. It was an excellent team performance but there were also some stand out performances from the combative David Perkins and Francisco Junior in midfield, Craig Morgan in defence and Will Grigg who led the line with aplomb. Latics made two changes to the team which drew with Doncaster on Sunday, with Donervon Daniels and Craig Davies replacing Leon Barnett and Max Power. Caldwell’s young team attacked from the kick off and won a penalty after only three minutes when Will Grigg was pulled back in the area by David Mirfin. Grigg stepped up and despatched the spot kick with ease. The early goal gave the Latics players confidence and they continued to press the Scunthorpe goal with Michael Jacobs, Davies and Grigg all linking up well. Latics doubled their lead just before the half hour mark through Donervon Daniels, after Jacobs’ cross had evaded the Scunthorpe defence the former West Bromwich defender fired home at the back post. Gary Caldwell’s team were on top of their game and the Iron had no answer. Latics nearly added a third just before the interval when Davies shot was well saved by Joe Anyon, before Jacobs volleyed the rebound against the crossbar and away to safety. It remained 2-0 at the interval, but it could so easily have been many more. The second half continued like the first with Latics controlling possession and dominating their opponents. Scunthorpe rarely threatened but when they did they were repelled with relative ease. The hard-working Perkins nearly got on the scoresheet in the 67th minute when he dribbled into the area past several Iron defenders but unfortunately he stroked the ball just wide of the far post. But Latics sealed the victory on 70 minutes when Davies latched onto Grigg’s superb through ball and fired past the helpless Anyon. Grigg might have added a fourth soon afterwards when he rounded Anyon and slotted home, but the goal was ruled out for a foul on the defender. No matter Latics had won convincingly and produced a delightful display of tiki-taka football which had the home crowd in raptures. Long may it continue. This entry was posted in Craig Davies, Donervon Daniels, League One, Scunthorpe United, Wigan Athletic, Will Grigg and tagged Craig Davies, Donervon Daniels, League One, Scunthorpe United, Wigan Athletic, Will Grigg. Bookmark the permalink.